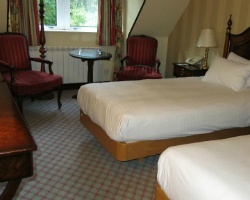 The Hilton Grand Vacations Club at Dunkeld provides effortless tranquility and the ultimate UK vacation experience. Find timeshare resales and rentals available at 70% discounts today with SellMyTimeshareNow.com. 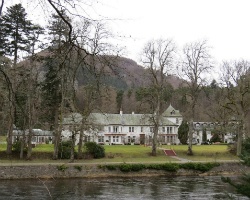 The history and magic of Scotland surrounds you at the Hilton Grand Vacations Club at Dunkeld resort. Spanning 280 acres, the vacation ownership portion of the property is made up of luxurious standalone lodge-style accommodations. The Hilton Dunkeld has created a truly unique vacation experience—roam around the property's well-kept grounds, or venture to the adjacent hotel to discover the lavish indoor swimming pool and beauty therapy center. Whether you find your peace relaxing in a sauna or outdoors among unbridled nature, there's a dream getaway for you at the Hilton Dunkeld House. The Hilton Dunkeld lodges range from two to three bedrooms in size, presenting groups both large and small with a place to call home. Well-suited for families, the homelike accommodations incorporate modern furnishings with a distinct Scottish flair to truly transport you. In-unit features like full kitchens, private balconies, and spacious living areas ensure that everyone in your group will have the space they need to be comfortable. With up-to-date entertainment systems and instant access to the great outdoors, the Hilton Dunkeld House will prove to be the perfect home-away-from-home. Are you ready to find your own high-quality vacation accommodations in Scotland? Fill out the form on this page to learn more about owning a timeshare at the Hilton Dunkeld resort, or call a representative at 1-877-815-4227. 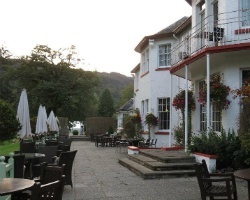 Owning a timeshare at the Hilton Dunkeld resort means you can take yearly trips to Scotland that are packed with exclusive features and benefits. However, buying that timeshare on the resale market can give you all that and more for thousands less. Timeshare resales at the Dunkeld House are offered for sale by their current owners instead of the resort itself. This results in the same exclusive ownership options available on the secondary market for prices up to 70% lower than retail costs. Timeshare resales at the Hilton Dunkeld House are typically available in either deeded fixed or floating weeks, or in the form of Hilton Grand Vacations Club points. You'll have a variety of options to consider when purchasing on the secondary market, ensuring you don't settle for a timeshare you don't like. Additionally, timeshares at the Dunkeld House span Hilton's Bronze, Silver, Gold, and Platinum seasons, which will provide you with a number of different price points to consider. The Dunkeld House is affiliated with the Hilton Grand Vacations Club, one of the most popular timeshare brands in the world. As a timeshare resale owner at the resort, you can take advantage of some of the club's most popular features and benefits. While you won't be able to enroll in the Elite level, you'll still be able to reap many of the rewards. Hilton points will allow you to make easier reservations and manage future trips through banking and borrowing. You can also spend unused HGVC points to redeem HHonors points, which can unlock in-room bonuses and discounts at any Hilton property. Furthermore, the ability to enjoy luxury vacations every year can extend beyond Scotland, as you can use your points to book reservations at other Hilton resorts around the world. As a timeshare resale owner at the Hilton Dunkeld, you can use timeshare exchange to explore other destinations around the world. With an RCI membership, you can trade your Scotland accommodations for stays at one of 7,000 other affiliated resorts worldwide. Additionally, the Hilton Grand Vacations Club at Dunkeld is a Gold Crown rated property, meaning you'll be able to exchange with other resorts of the highest quality. You can also trade your timeshare for RCI points, which can lead to exciting cruises, exclusive weekend getaways, and so much more. This luxurious Scottish retreat has all you need to enjoy a well-deserved break from the daily grind. On-site amenities like the indoor swimming pool, sauna, and peaceful solarium offer the perfect chance to relax and unwind. Enjoy a complimentary afternoon tea or head to the bar and lounge later to enjoy some of the region's finest Scotch whisky. Enjoy dinner prepared with locally-sourced ingredients at the adjacent Dunkeld House Hotel for an exquisite culinary experience. Around the resort, you'll find the Highlands has plenty to offer excited travelers. 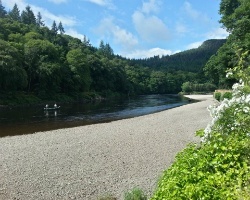 Hike through the beautiful Cairngorms National Park to conquer mountain peaks and river trails, or discover great golf at the Dunkeld & Birnam Golf Club. Head south to central Scotland to traverse the nation's metropolitan centers of Edinburgh and Glasgow, or visit Stirling to tour the National Wallace Monument and Stirling Castle. Far to the north you'll find legendary Loch Ness—see if the rumors are true by trying to spot the elusive Nessie, or roam the streets of the old city of Inverness. Already Own at Hilton Grand Vacations Club at Dunkeld?